Amazon #1 Bestseller & New Release! 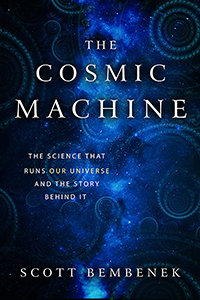 Note to educators & libraries: As part of Zoari Press' commitment to better science communication & education, we encourage educators, schools, universities, colleges, and libraries to learn more about using The Cosmic Machine as an engaging source to supplemental standard classroom texts. Contact us directly for an evaluation copy & potential discount opportunities. Note to students: If you're taking an overview of physics class (e.g., "Ideas of Physics" or "Concepts in Physics") or science history class, consider supplementing your primary text with the The Cosmic Machine. Contact us to learn more and possibly qualify for a free copy.